An arctic blast will bring much colder air into the area starting Tuesday and lasting through Thursday, with the coldest temperatures and wind chills expected to occur on Wednesday, according to the National Weather Service. Overnight lows locally will range from around zero to the low teens below zero, with daytime highs on Wednesday several degrees either side of the zero degree mark. Dangerously cold wind chills are expected at times during this period, with the coldest wind chills anticipated for Wednesday morning and early afternoon. A moderation in temperatures will begin on Friday, with temperatures getting close to freezing for parts of the area. 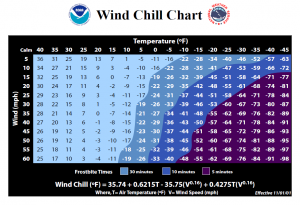 These extreme temperatures may have significant impacts on infrastructure, including residential and business plumbing, municipal water mains, and human and animal safety. Parts of the area will likely see temperatures at or below 15 degrees for 48+ consecutive hours from Tuesday evening through Thursday night. recautions should be taken including checking in on the elderly, keeping pets indoors, and ensuring agricultural animals are indoors with ample food and have access to unfrozen water. Keep space heaters in a safe location where they will not tip over. Alternative heating units should be well ventilated to ensure that the silent killer of carbon monoxide does not build up and become a hazard. If plumbing lines are poorly insulated or are known to freeze, keep a constant flow of water by leaving a faucet or two slowly dripping. If pipes are located along the outside wall, open cabinetry to allow heat to circulate around the pipes if possible. Do not venture outdoors for any length of time late Tuesday through Thursday without proper cold-weather attire.